I have never had a great regard for new year’s resolutions, but I think we all should use the approach of a new year to think about how we can honor our Savior in a greater way. With this in mind I wish to use the above text to propose a challenge to all of you who are saved by God’s grace. The challenge is to do what you can to serve the Master and glorify Him. These words were spoken by Jesus in commendation of a woman who had poured over his head a costly flask of ointment. This sacrificial deed of this woman was of course an outward expression of her intense devotion to Jesus. She was rebuked by some for what they considered a waste, but Jesus defended her. He said, “She has done a good work for me” (v. 6). Jesus said that she did what she could. There were obviously many things that she could not do. She was not an apostle. Unlike them she could not go out and heal people or perform other miracles. She would have not been able even to preach in a public way. But she did have some very valuable ointment, which she gladly poured over the head of God’s son as a way of showing her love for him. I think there is a powerful lesson here for all of us. The lesson can be stated simply and shortly: God wants us to use the abilities we have, all of them, with full dedication to his glory. The Lord has given talents, gifts, abilities to all his people. He is sovereign in this. He does not expect us to use gifts we do not have. But what we can do, we should. Here are some self-evident truths. Each of us knows there are things we cannot do. Perhaps you cannot preach, or play an instrument in church, or sing. You my not be adept enough in math to serve as a treasurer. But there are things you can do. I take it for granted that if you are a child of God you spend time in prayer. This new year I urge you to pray more earnestly. Pray for your family, pray for your pastor and the members of the church, pray for those in authority in government (1 Tim. 2:1, 2) — for a while at least quit criticizing and intercede for them. Do you have an income? This year I challenge you to dedicate 10% to the Lord. Although tithing is not commanded in the New Testament, it is a pattern and example established long before the law of Moses (Heb. 7:4; Gen. 28:22). Just do it. You can encourage people and witness. 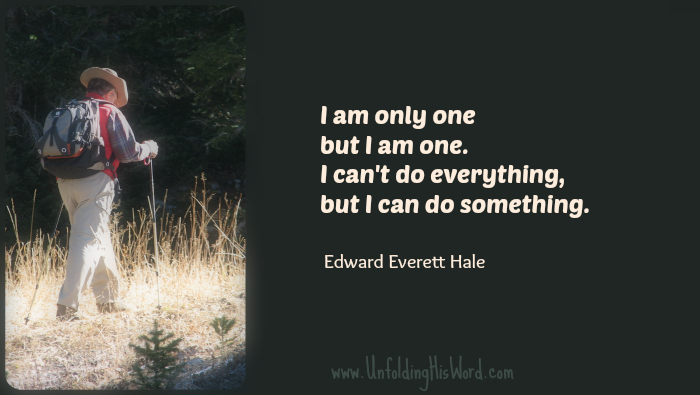 Here is a motto I found attributed to Edward Everett Hale. Read it carefully. Polls indicate there are 39 million evangelical Christians in the United States. This is a sleeping army, in my opinion. What would happen if they all would do what they can to glorify the Lord and spread the principles of his kingdoms in our troubled country? I believe we would see revival and tide of evil turned back. This is my challenge for you this year. Do what you can like the devout woman in our text. John F. Thornbury, Th.M., D.Min. 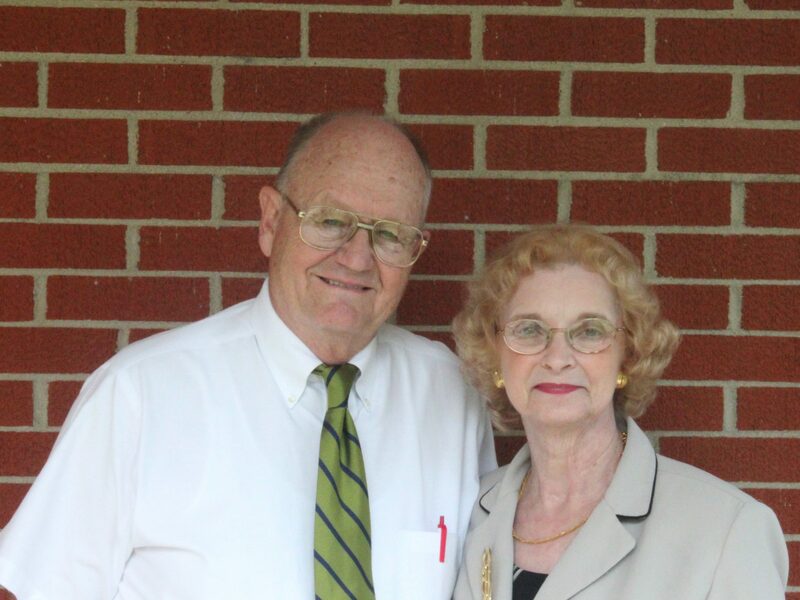 is the former senior pastor of Winfield Baptist Church in Winfield, PA and has served as senior pastor in Southern Baptist, Independent, and American Baptist churches in PA and KY for over 50 years. He has authored numerous articles and books, including the prize-winning biography of David Brainerd in Five Pioneer Missionaries. 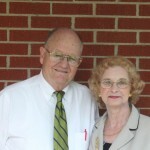 He and his wife, Reta, currently reside in Lexington, KY where he serves as the worship pastor at Bellepoint Baptist Church in Frankfort, KY.